The Delhi Dialogue 9, themed this year on "ASEAN-India Relations: Charting the Course for the Next 25 Years", begins in New Delhi this evening, with Minister for External Affairs Sushma Swaraj hosting the ministerial session. Political leaders, policy makers, senior officials, diplomats, business leaders, think tanks and academicians from both sides are participating in the discussions. The Delhi Dialogue, being held annually since 2009, is a premier annual track 1.5 event to discuss politico-security, economic and socio-cultural engagement between ASEAN and India. This dialogue is being organised by the Ministry of External Affairs in collaboration with Observer Research Foundation (ORF), Federation of Indian Chambers of Commerce and Industry (FICCI), Institute of South Asian Studies (ISAS), Singapore, SAEA Group Research, Singapore, Economic Research Institute for ASEAN and East Asia (ERIA), Jakarta, Institute of Strategic and International Studies (ISIS), Malaysia, Diplomatic Academy of Vietnam, Indian Council of World Affairs (ICWA) and ASEAN-India Centre. It is supported by the Indian Council for Research on International Economic Relations (ICRIER); the Confederation of Indian Industry (CII); the Associated Chambers of Commerce and Industry of India (ASSOCHAM); All India Association of Industries (AIAI), Mumbai; and Indian Chamber of Commerce (ICC), Kolkata. 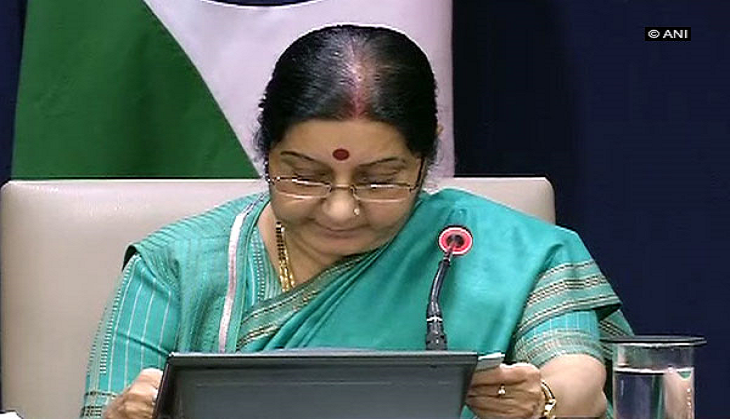 Besides Mrs Swaraj, the ministerial session would be participated by Gen. (Dr.) V.K. Singh, Minister of State for External Affairs; Mr. Sarbananda Sonowal, Chief Minister of Assam; Mr. Pham Binh Minh, Deputy Prime Minister & Minister of Foreign Affairs, Vietnam; Mr. U Kyaw Tint Swe, Union Minister, Ministry of the Office of the State Counsellor, Myanmar and Mr. Hirubalan V P, Deputy Secretary-General for ASEAN Political-Security Community Department, ASEAN Secretariat. Gen. V.K. Singh will participate in the panel discussion of the Ministerial Session titled Waters of Asia: Cultural, Social and Political Ties along with Dr. Maliki Osman, Senior Minister of State for Defence and Foreign Affairs, Singapore; Mr. Virasakdi Futrakul, Deputy Minister of Foreign Affairs, Thailand; Mr. Sengphet Houngboungnuang, Deputy Minister of Foreign Affairs, Lao PDR; Dato Erywan Pehin Yusof, Deputy Minister of Foreign Affairs and Trade, Brunei Darussalam and Dr. Sok Siphana, Advisor to the Royal Government, Cambodia. The Business and Academic Session would be held parallel to each other following a joint inaugural session on 5 July. The joint inaugural session will be addressed by Secretary (East), Ministry of External Affairs, as well as by the Presidents of FICCI, CII, ASSOCHAM, ICC, AIAI and Vice President of ORF. The five business chambers, namely FICCI, CII, ASSOCHAM, AIAI and ICC will chair a panel discussion each in the course of the day on the following themes: International economic trends and their impact on India and ASEAN; India-ASEAN Trade Relations; Building Regional Network to promote SMEs and Women's Empowerment; India-ASEAN Infrastructure Investments: Current Scenario and the Way Forward; and Trade & Tourism through Connectivity - Focus North East & East. ORF is organising the Academic Session which would feature panel discussions on the following themes: Regional Geopolitics: Great Power Politics in the Asia-Pacific; New Connectivity Paradigms in the Asia-Pacific; Technology, Innovation and Big Data; and Socio-Cultural Engagement and Diaspora Links. These academic sessions will be participated by scholars and experts from prominent universities and institutes in India, Indonesia, Vietnam, Malaysia, Japan, Cambodia, Singapore and Laos. There would be a Concluding Plenary titled Looking Ahead which will focus on key takeaways from Delhi Dialogue 9 to chart the course for India-ASEAN relations for the next 25 years. The 10 member Committee of Permanent Representatives of ASEAN countries and 15 senior media personnel from ASEAN would be attending the event. A live webcast of the proceedings of the Ministerial Session on 4 July and the Business and Academic Session on 5 July will also be available.